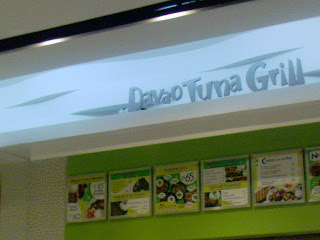 When Trinoma's newly opened Landmark department store and supermarket opened late 2007, the foodcourt was a brand new addition as well to shoppers who were on a budget. The foodcourt was huge, spacious and well lighted...with pastel colors, mostly green trying to portray the ambiance of a picnic area. While we were eating though, we noticed a four-legged animal from afar walking behind the fastfood signs on top of each eatery. When it came closer to our way, we realized that it was a cat. Someone pointed it out to the security guard but he was kinda stumped on what to do since it was like 15 feet above everybody. It suddenly stopped at one food stall, and looked like it was pondering how it could grab a bite of all that tuna below it. I saw some of the people below lined up, a bit scared if the cat would jump on their food. Some people who haven't ordered yet left the line for fear that the cat may be causing an unsanitary environment. If you look closely behind the letter "D", the cat just passed by it.